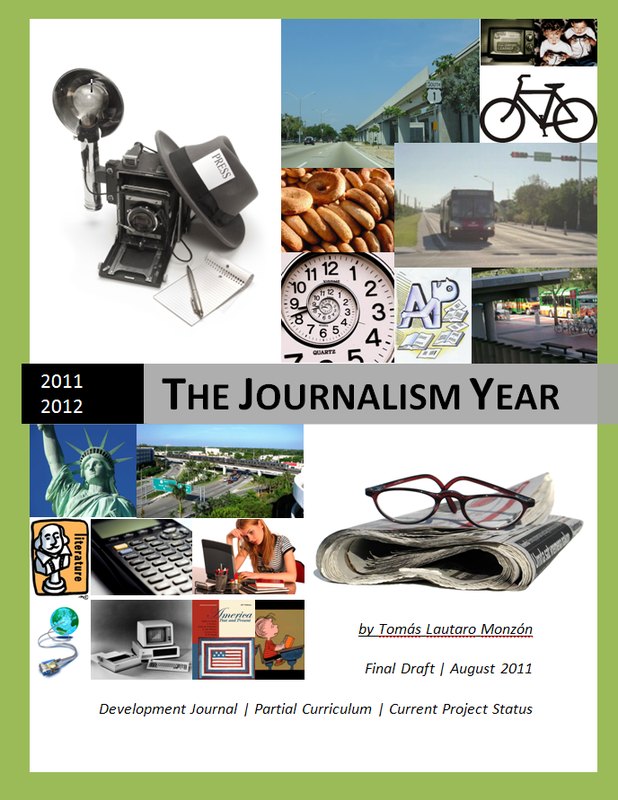 The cover to the Final Draft of The Journalism Year. Only time will tell if the project will indeed achieve 1st Edition status. For now, it stands as a memento to both the idea itself, the work undergone, and the spirit it’s fomented. Summer 2011, like so many summers before it, has indeed come to an end. The special thing about this summer, of course, is that it prefaces one of the most exciting and also worrisome school years yet: senior year of high school. Long before now, I thought of senior year as last stand of sorts, as the last chance to get it all right, from academia to attitude to experiences had. And indeed, I still think of it this way. This is my time to close this chapter of my life with the best ending possible. That responsibility, even if only applicable towards myself is a daunting one. Some parts of senior year – applying for college, the classes I’m now going to take, the activities that are planned for the senior class – I predicted. For a long time. What I didn’t predict was what my approach to all of them would be. What kind of person would I be, with what outlook and opinions and values and beliefs, when senior year came around? This, I could only ponder indefinitely. But now the time has come. And luckily, one endeavor – which was conceived long before thoughts of senior year came around – is exclusively symbolic of my approach to this act de resistance moment. As you know, this endeavor began asw a purely academic pursuit. Finding shortcomings in the journalistic offerings of my TV Production magnet, I began drafting an auxiliary curriculum that would focus on these underrepresented aspects of TV Production – writing, understanding news and trends, interview skills and more – and be delivered to the incoming freshmen for this 2011-2012 school year. It was born out of a growing understanding of journalism as well as a genuine desire to improve the program and maximize the opportunities it could offer to its students. It aimed to supplement, not supplant, Mr. Diaz’s incredible designs and curriculum, which, believe it or not, have been my driving force all these years of high school for much more than just projects in the class. But changes occurred. Mr. Diaz left the television program at South Miami for the one at Coral Reef, for understandable reasons. Someone else came in as his replacement. When I found out that this was happening, I was dumbfounded. Not because of the project’s now doubtful feature, but because such an amazing influence had left my immediate vicinity – the TV studio. The very place where he’d taught me and the rest of us so much. It was not easy news to take. Following that realization were my thoughts about the project. Where was it headed now? Was it worth completing it according to plan? Those questions weren’t answered in the nick of time. But one very important realization supplanted those doubts. The project had grown, and its spirit remained as intact as ever. Whenever I fantasized about how the project would run throughout the year, I saw myself as someone who had internalized an enhanced set of values. As junior year was going on, and then as summer vacation came and went, I began thinking about all the less-than-perfect approaches I had towards so many different things, namely my priorities and my attitude. It was a classic growing up moment. I realized the fallacies in my daily schedule, in my work ethic, in some of my decisions. Those realizations connected with the Journalism Year because, to succeed as a teachable curriculum, the Journalism Year needed a strong lead. As its designer, that strong lead needed to be me. As a result, I changed. All those realizations piled up into what is now The Journalism Year Pact, a collection of self-analysis and psyching sessions that reflect the philosophy and thoughts I’m taking with me as I enter senior year. Prioritize social activity. Work well – better than ever – but on time. Know what’s good for me and what’s not. Think ahead, maintain foresight in as many things as I can. All typical, maybe even common sense realizations – but for a teenager growing up, they might as well be Holy Grails in their own right. Thus, the project is now me. The actual curriculum part of it stands incomplete due to logistical considerations and the fact that the program will be restructured fundamentally, but the spirit of the program – the thoughts it provoked, the emotions it caused – remains intact, in me. Summer 2011 was also a teaching experience. Finally, after so many years, I’d achieved what I’d sought for so long – an adventurer spirit, one that could wake up in the morning, think of a destination, and go there. Many days, as I traveled around the city whether on bike, bus or through my own two legs, I felt like I could go wherever I wanted at any time. Granted, that had its limits. But it was there. And I felt it. And it felt nice. I take such values and lessons into The Journalism Year – both its academic and spiritual components – and, by extension, into our senior year of high school. May our last year be our best … in so many ways. Here’s to senior year! Class of 2012!